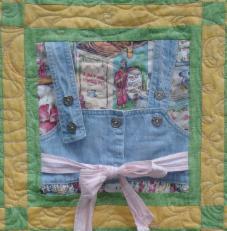 Comm'n Gallery 1 - The Joyous Quilter - Quilts and Patterns For Sale, Commissioned Quilts, Quilt Gallery, Quilting Tips & Tricks, Quilting Green and more! 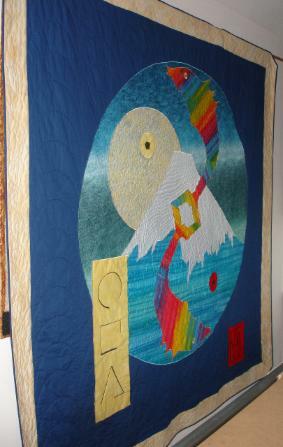 Welcome to my gallery of those quilts I have been commissioned to create over the past couple of years. I have been hard at work on a number of quilts lately as you can see below. This page gives me the opportunity to provide more detail about each piece, including the specific techniques I may have used; the type of fabrics and the time taken to make each one, as many people are surprised to discover just how many hours it takes to make a quilt. 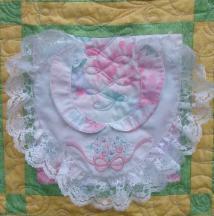 The first quilt was for the youngest lad of the three. The fabric that was between the striped blocks was a rayon sarong that was worn with a bikini. I cut it so that the pointed design that was at either end was kept in the same spot so the whole sarong is there but just in elongated form. The whole thing was set off nicely by a turquoise batik which had little donuts of many colors all over which neatly tied in all the colors throughout the pieces of clothing. Three young teenagers sadly lost their Mom to breast cancer a while ago. Her sisters chose some of her clothing that was distinctive of her personal style, and cut them into strips and then sewed the strips together in random collections of four, then they asked me to complete the quilts. These quilts were quite an interesting challenge as, although the quilt design was simple and straightforward, there was such a wide variety of fabrics, many of which presented some unique challenges. Many of the fabrics were stretchy or flimsy or frayed terribly on handling, so much care and pinning was necessary, plus that wonderful stuff – FrayCheck! The second quilt was for the eldest lad. The fabric for the ‘plain’ block was partially from a dress – I cut as many 8.5” x 5.5” pieces as I could from the dress (26 – exactly half of those required) but still needed more, so I found a batik that was as close a match for the other 26. I thought that placing them in a diagonal arrangement would be the most interesting. The center was set off nicely by some wild and modern prints for the border and binding. 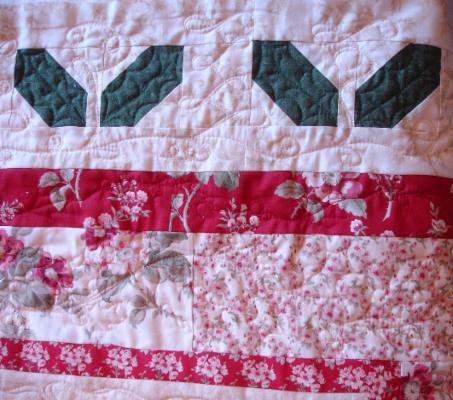 Last but not least was the quilt for the girl. For the plain blocks, there was a rayon skirt and a floaty blouse which had to be include. From the blouse there was only enough fabric for four pieces so I decided to put them in opposite corners - top right and bottom left. From the skirt I could only get 14 pieces so they featured diagonally either side of the center, then I filled in the rest with a beige Fusions fabric. In addition there was a couple of strips of satin fabric with embroidery and beads – I later found out this was apparently the cuffs from a favorite bathrobe! After unpicking them and laying them flat, they were the perfect size for one of the strips in the striped blocks, so they were included – quilting around the beads was a minor challenge though!! 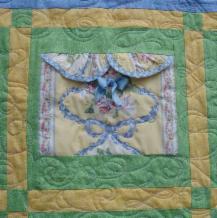 The border fabric was a sweet floral which I decided to offset with cornerstones of the beige Fusions. Each of the quilts were quilted with a different design to further make them unique. Their Aunts presented the quilts to them just after Christmas and they had a wonderful time pointing out different pieces and reminiscing about the occasions upon which Mom had worn that particular garment. Fabrics: To name but a few of the fabrics; denim; chiffon; lamé, flannel, lace, terry, knits, fleece, fabrics with sequins and beads, rayon, velvet, satin, suede, tartan weave as well as good old reliable cotton. As well as the clothing fabrics mentioned Batiks, Fusions 6644 and floral prints were also used. 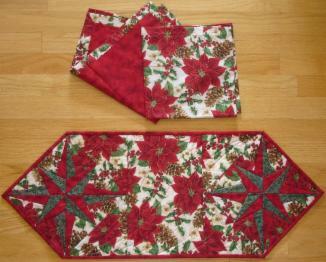 A dear friend of mine asked me to make her a table runner and matching napkins for Christmas from some beautiful Christmas fabric that we found. I used EQ7 to design the table runner and printed the paper foundations; paper piecing is wonderful at providing the ability to get such long and skinny points with a high degree of accuracy. The napkins are double sided; the back wraps around to the front and is finished with a mitered corner with an insert of another co-ordinating color – in this case, red. table runners and 12 napkins for me. to compliment those I had already picked. and I could select the one I liked best. and her business demeanor are rare to find. The star stands out much clearer on the smaller birds and berries print (top pic) and blends more with the poinsettia fabric. 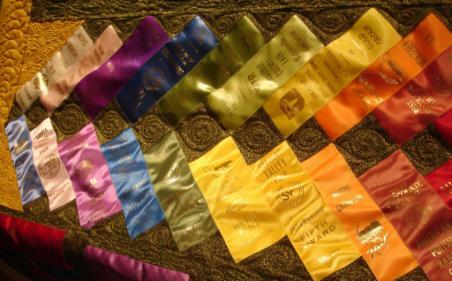 "While in the process of moving, we found numerous boxes of fair ribbons from our daughter's years showing livestock in 4-H and FFA. They had been boxed for several years and were destined to stay that way unless I found a way to display them. In my search for a display idea, I was given Louise's contact information. After meeting with her, and going through the ribbons, she agreed to give it a try! We met often so that she could show me her latest design ideas and we could brainstorm further. After five months, many get-togethers, and numerous design drafts the quilt was complete. I was utterly astonished when I saw the completed project. It was more than I could have ever imagined. My husband and I presented the quilt to our daughter on Christmas Eve and her reaction was everything we hoped for! It was truly a pleasure working with Louise and seeing her artistic creations come to life!" This was a really interesting challenge! My client’s daughter had spent 10 years participating in 4H showing horses, sheep, pigs and rabbits. 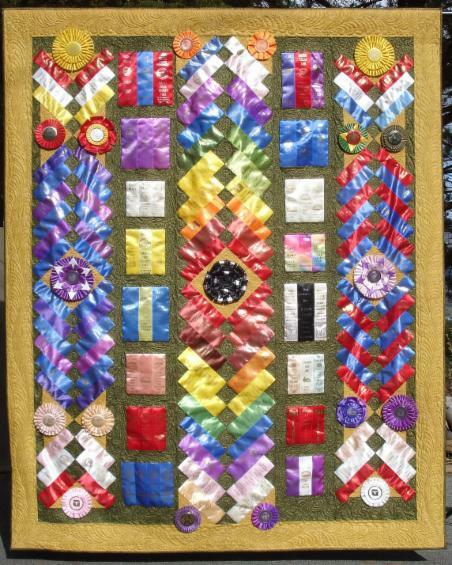 The ribbons had then spent a number of years in a large box in the attic until my client moved house and they were rediscovered and she had the brainwave to turn them into a quilt. A couple of designs were considered before I had the inspiration of using a French Braid layout – the only initial problem with that was that normally the ends of the strips in a French Braid are trimmed straight but I quickly realized that this would cut off some of the text at the bottom of the ribbon, so I had to add a square of fabric to the other end of each ribbon as well as the one in the center; these would then be trimmed. 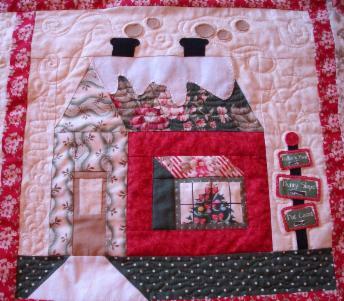 Each ribbon was top stitched at the edge using a matching color of embroidery thread. This young lady had worked so hard over so many years that there was a huge box of ribbons to choose from, which was wonderful for me and made the design process so much more interesting! I was able to make this wonderful rainbow effect in the center as well as two other braids from her first and seconds awards, plus two other strips with groups of similar ribbons....and still there were some left in the box! The quilting took three days to complete with McTavishing in the diamonds and triangles where later the rosettes would be attached; swirls in the diamonds in between the ribbon braids and feathers around the borders. The feathers go from bottom to top on the side borders and in both the top and bottom borders the feathers start in the center and work out to the corners. The quilting is all hand-guided as I do not have a computer attached to my mid-arm machine. Fabrics: Green and Gold Kaufman Fusions 6644. Quilting: Freehand custom work with swirls, McTavishing and Feathers. "Ask anyone that knows me and they will say that I am not often rendered speechless. But on Christmas Eve, when my parents presented the Fair Ribbons quilt to me, I was just that - speechless! I remembered going through the ribbons when my parents were moving, but I had no idea that my mom and Louise had met. The quilt, with it's well chosen pieces, brought back so many wonderful memories of my years showing livestock. I will be forever grateful to both Louise and my parents for this amazing keepsake!" Here is a fun t-shirt quilt for a young lady who has done Gymnastics for many years and is now off to college and wanted a quilt to take with her. Once again I used EQ7 to create this design based on an irregular grid layout which I expanded to accommodate all the t-shirts. 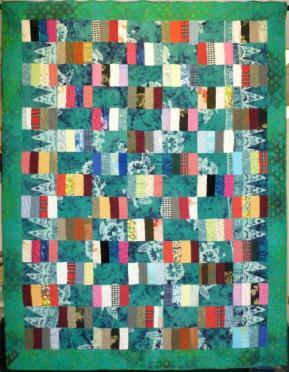 The two different colors in the outer border lend an almost 3D appearance to the quilt and lighten the colors. 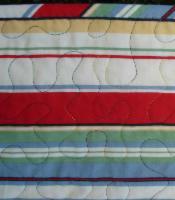 The extra length means that the quilt can be tucked in front and over the top of the pillow. The quilting pattern was stitched with an aqua colored thread on the top which brought the whole design together by contrasting with, and brightening, the large areas of dark fabric and making the small aqua fabric pieces ‘pop’. It is always fun to figure out ways to include various elements on the quilt; one of the blocks came from a top that had a motif either side of a V shaped neckline, which of course would have been tricky to include in the middle of the quilt. Fabrics: Blue, Aqua and Black prints with black & white flannel on the back. I was flattered to be recently asked to quilt someone else's quilt; a lovely lady at my Guild. This is one that required custom work in a whimsical style in keeping with the style of the quilt, and every block was a little different. It was interesting to do this one, and made a nice change from using an all over pantograph pattern as there was much more thought involved in considering what was to go on each block. 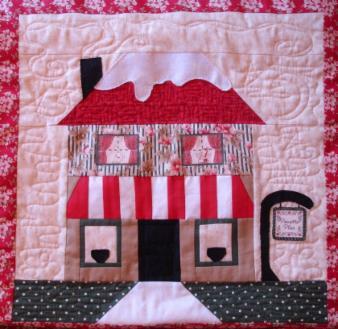 "Holly Lane was a block of the month at the local quilt shop. Once I did the first house block, I couldn’t stop. It didn’t take very long to get the top completed. I approached Louise to see if she would be interested in quilting it for me and she was up for the challenge. 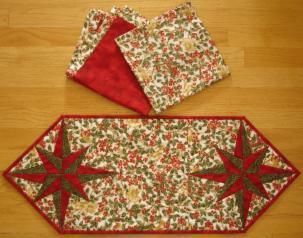 When the quilting was done, it seemed like Christmas! The quilt was so beautiful! Everywhere you looked there was something a little different in the design. 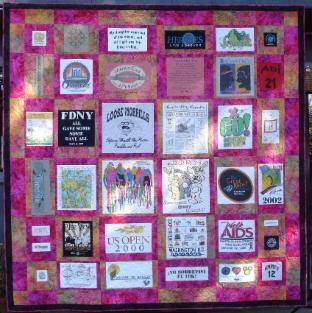 Thank you, Louise, for helping to make this a quilt that will be passed on for generations." 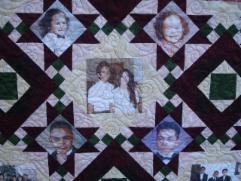 I enjoyed working on this quilt to celebrate a 39th Wedding Anniversary. I came up with an original design (using EQ7) in which to fit at least 30 family photos - as it turned out there was space for 33; 21 large (7.25") and 12 small (5.25"). Each of the photos had to be scanned from the original, then printed onto special fabric which can be incorporated into the quilt in the same way as any other fabric. 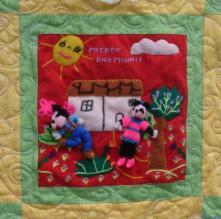 The fabulous thing is that the quilt can be washed on the 'Delicates' setting and the photos remain vibrant. Although this quilt was intended to be used on a bed, a sleeve was included so the option to hang on a wall was possible. 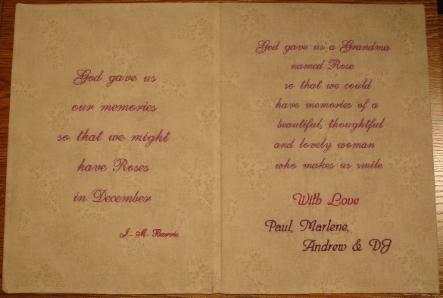 The back was simply the Merlot coloured fabric which matched the decor of the recipient. Fabrics: Kaufmann Fusions 5573; Merlot, Jungle, Sand, Antique and Espresso. This was an interesting quilt to design in that there were so many pieces that were large (around 17") and then a number of smaller pieces. 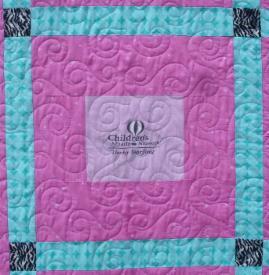 Using quilt design software called EQ7, I found this irregular layout which worked perfectly. Alternating the two background fabrics provided the distinction between the blocks without the need for sashing in between the blocks which made for a nice alternative design. These t-shirts were of many different events and places that this family had been involved in or attended over a number of years. The back features both sides of a t-shirt from a family reunion which was "Loud, Proud and Crazy"! Incidentally, the light patches are splashes of sunlight through our trees onto the patio where I was taking this photo! prior to taking a blade to any fabric! "For over 2 years I searched for the right person to do my t-shirt quilt and knew she was the right person once I met Louise. Louise was very sensitive and intuitive with my intent and offered much needed advice and direction, always keeping me abreast as the quilt was in development. My quilt represents all sorts of memorable family and friends events. The selection of colors represents my and my lovely mother's favorite! Everyone loves it and cannot believe how beautifully worn t-shirts can be preserved. 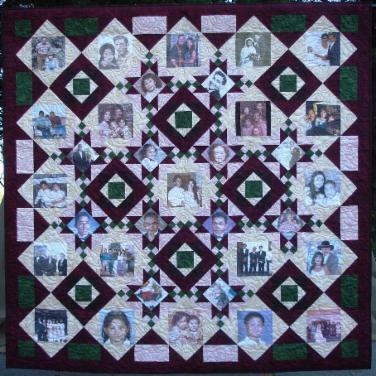 The quilt was made not only for my enjoyment but my family can continue to appreciate it in my after life." These two quilts were fun to make as my client had the terrific idea of personalizing the quilts with each child's adorable photograph. She would have loved to have made them herself, but lack of time and know-how meant she didn't quite know where to start. These quilts were made in a very short space of time in order to be ready in time for birthdays shortly after Christmas. Although a simple construction, the appliqued photographs made for a small challenge during quilting as I did not want to quilt across the photos as they were the focal point of each quilt. "I have been blessed with 5 grandchildren and two of them, a boy and a girl, born 3 days apart, from different daughters were going to be celebrating their 3rd birthday the week after Christmas!! I had an idea to give them a special gift that would be treasured for years to come. My idea was to make a quilt with their picture in the center surrounded by fabric that was reflective of their personalities. I had the idea, I just needed to get it executed, and I didn't have a clue how to begin, and my target date to begin this overwhelming project was fast approaching. So I went into the Quilt store and met this absolutely wonderful woman, named Louise, with whom I felt immediately connected. I shared my idea with her, and was comforted by her very calm demeanor, and willingness to see my idea come to reality. I had little time to spend with her, but I gave her explicit details of what I wanted. I had the pictures of my little ones, and I had fabric for only the little guy, Cars by Disney, I knew that for sure. I hadn't yet found just the "right" fabric for my little girl. Louise assisted me in finding the fabrics for the quilts in both little boy and little girl themes, and produced, in a very short time, two beautiful, personalized quilts for our Jojo and our Bella. When they opened their gifts, at the same time, the reaction from them, as well as their parents, was exactly what I had envisioned, surprise, joy and gratitude. My meeting Louise was a gift, in that I was able to see my vision materialize and give these unique gifts to my grandchildren for their birthday. 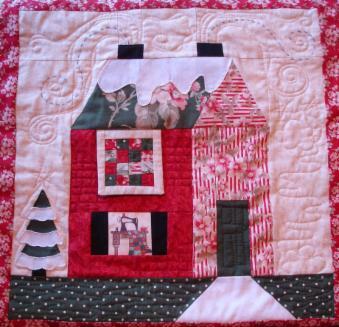 She was a delight to work with, and I know that these quilts were made with much warmth, and great affection." Fabrics: Bella's: Little butterflies on a pink background for the main fabric and binding and ladybugs on a green background for the border. 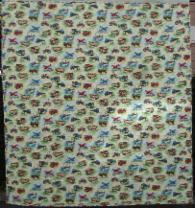 Jojo's: Carz by Disney with yellow and aqua texture for the borders and binding. "My husbands’ Grandmother, Rose was turning 96 this year. What do you give a very active 96 yr old who wants nothing? Well we found the perfect gift – a Birthday Card- But not just any Birthday Card- this one was handmade, sewn and embroidered! 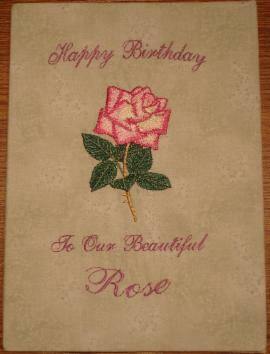 How do you think Grandma Rose responded to her beautiful birthday Card with the embroidered Rose? She was so happy and in awe as she is a very “handy” person herself that we had to find a way that she could frame it and display it for all prosperity. Thanks Joyous Quilter, you made a very special Grandma feel even more special and she can now look at her birthday card for the rest of her very active, long and blessed life!" Paul & Marlene, Morgan Hill, CA. Friends of ours saw a fabric birthday card that I had previously embroidered and constructed for my Hubby, and they thought it would make a neat card for an elderly Aunt who had an upcoming special birthday. Unfortunately these pictures don't do the card justice as the fabric was a beautiful pale green, with the same fabric print, but in beige, on the inside. Similarly the embroidery threads glistened and shone in the light. But the photos, taken in the evening under artificial light, make it look like shades of pink! Fabrics: 100% cotton flats. Fusions print. 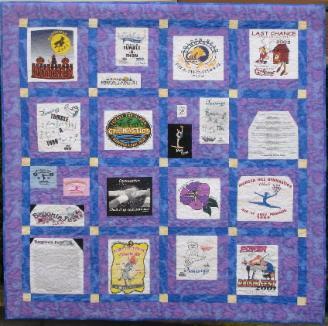 This quilt was made for a wonderful young lady who was a cheerleader for many years, and had collected her t-shirts from the many different events she attended. Other important events in her life were also included, such as a t-shirt to pay tribute to her brother who recently served in Iraq. The terrific modern and bright colors that were chosen by my client really made this quilt cheerful, and the colors worked well with the t-shirt colors to ensure that the many dark pieces did not make the overall quilt design too dark, thereby in keeping with the quilt's name. "As I began packing to leave college and start a new chapter in my life I couldnt help but sort through the memories as I continued to pack numerous t-shirts from my past. I had shirts from all my years of dance, cheerleading and being in a sorority and wanted to keep them but thought it was pointless for them to live in a box. Thats when I thought it would be nice to make them into a quilt, something I could use and keep forever. When I found Louise, I was thrilled, and after meeting with her and telling her my vision, I knew she was perfect for making my vision a reality. She was so great to work with, kept me updated throughout the process and my quilt turned out perfect! I know it was a lot of hard work for her because it's HUGE but I also know she put a lot of love into my quilt because she loves what she does. "Life is Beautiful" is the name of my quilt because that is how I choose to view life everyday!" Cary F, Morgan Hill, CA. Fabrics: Pink polka dots, aqua pattern and zebra prints. "I went to Louise with a box and a picture and asked her if she could make a patchwork quilt out of the pieces of my Dad's clothing in the box. She wanted to get to know my Dad and me, so we chatted for quite some time. Then she asked if she could create a few design samples for me to look at. All I could imagine was a simple patchwork quilt but what we ended up with was a beautiful memory of my Dad created by Louise with her vision, artistry and attention to detail. I trusted her and I am so happy I did. She captured my Dad and his life through her vision and design. She kept me in the loop throughout the entire process. Louise is a very talented, gifted and professional quilt maker. My daughter was overwhelmed with emotion when she saw the quilt. She had no idea it would be so wonderful. She will be getting married in September and other family members will have the opportunity to see it...what we consider a true work of art." When this commission came my way it was a wonderfully interesting design challenge to create a heartfelt memory quilt of a father/grandfather who was obviously dearly loved. A large box contained a wide variety of clothing that each needed to be included. All kinds of shirts from casual Hawaiian, through work shirts and embroidered dress shirts to denim; various suit pants; numerous ties including some beautiful silk ones; handkerchiefs; two flannel bathrobes and even a satin embroidered Rodeo jacket! The creative challenge was to put all these different items together into one cohesive design! I was extremely pleased with the result. I used the versatile "Drunkard's Path" template to achieve this wonderful blend of fabric types, thicknesses, colors and styles for the front. I looked at each item of clothing and cut individual pieces that had interesting features such as embroidery, buttons, monograms, or an interesting pattern on the fabric print that would flow with the curved shape. I paid attention to the placement of any stripes on the shirts or interesting features on the ties (which were first disassembled) and placing them on my design wall piece by piece; rearranging them until I had blocks that I liked. 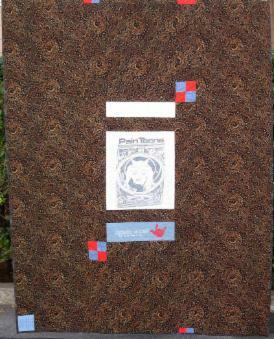 Surrounding the blocks are fabrics in Dad/Grandpa's favorite earthtone colors; reflecting his love of outdoor pursuits. Twenty eight 10.5" squares of the two flannel bathrobes, were combined with a mixture of three other flannel fabrics of similar look to create a cozy and comforting secondary pattern on the quilt back. 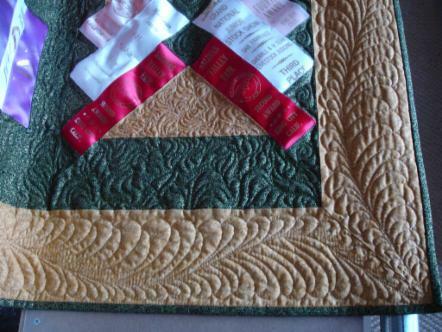 This quilt was made as a Graduation gift for a young lady who is soon off to university. There were items of clothing from all stages of her life right through from infancy to teens, with various embellishments and trimmings. Everything from romper suits, school skirts, favorite dresses and t-shirts were included. This one had to be custom quilted because there were so many prominent features such as lacy collars, big sparkly 'jewels', buttons, ribbons tied in bows and even felt 3D figures of Mickey and Minney Mouse! An all over pantograph would have been impossible with all these obstructions so a custom design was quilted with lots of swirls, scrolls and spirals which flowed from one block to another, going beyond the 'boundaries' of each block which created a flow from one to another. Even after the majority of the quilting was completed on the large frame, certain details on the clothing sections were further free motion quilted on a regular sewing machine to ensure the integrity of the quilt layers. Fabrics: Blue, Green and Yellow matching "Scribble" print. 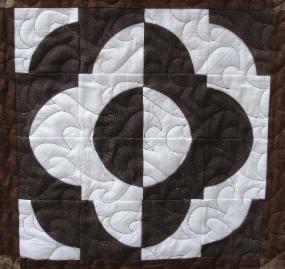 Quilting: Custom swirls and scrolls, plus free motion. "I wanted to let you know that my daughter loved the quilt and she showed it off to all our friends at the graduation party on Sunday. I let everyone know I had met a very talented woman in Morgan Hill and if they ever wanted a quilt made to come to you. Thank you again Louise. We love it and it is a keepsake we will treasure forever!" This quilt was made for a local elementary school to celebrate 20 years of their annual Walkathons. T-shirts had been saved from each event and were framed with a selection of alternating red/black background prints which reflect the school colors. 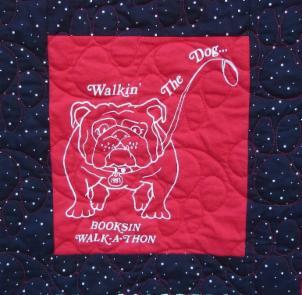 The school mascot is a bulldog, so the perfect quilting pattern was the dog paws shown in the picture below. 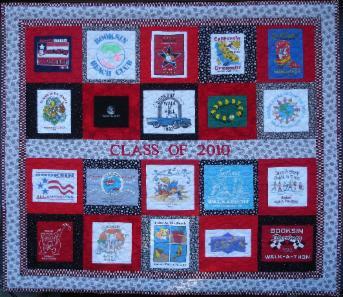 The 5th Graders are the "Class of 2010" shown in the panel across the center of the quilt which I designed and embroidered in 3" high red letters. 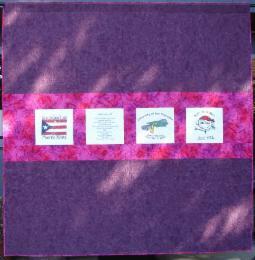 They presented the quilt as a gift to hang in the school and they all signed the outer border. "It IS beyond what I thought!!!!! I don't want to give it up!!!!!!! Thank you!" Fabrics: Black, white and red prints. 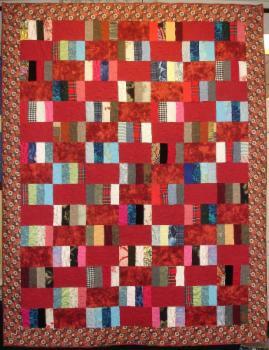 Quilting: Pantograph: "Pawprints" in red thread. 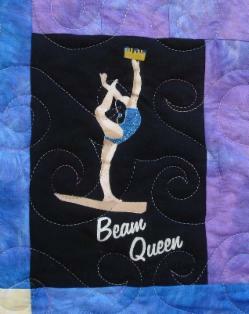 This quilt was made for a young lady who has practiced and competed in gymnastics for many years. 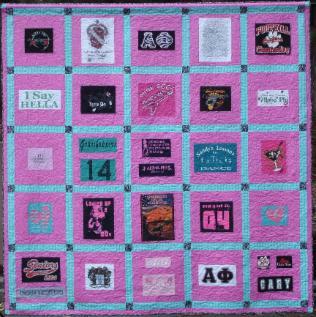 Originally the task of making a quilt from her event and club t-shirts was given to her Grandmother who did a beautiful job of stabilizing the shirt panels but then wasn't sure how to go about the remainder of the task! The fabric colors chosen were very feminine and the yellow cornerstones really brought out the yellow elements in many of the shirt panels. We later found the perfect fabric for the back (shown here on the right). 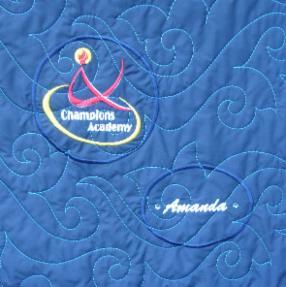 Once the quilting pattern was chosen, both the backing and quilting really represented the fluid and swirling movements in gymnastics. "A memory quilt for my teenage granddaughter Amanda! T-shirt squares from Amanda’s gymnastics ‘meets’ were used and fabrics in Amanda’s favorite colors frame the squares and cover the back. 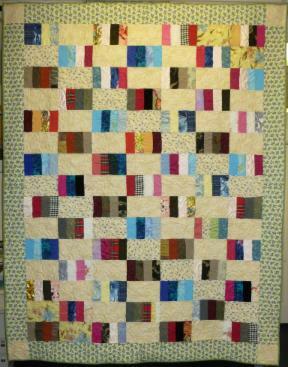 I presented the finished quilt to Amanda on Valentine’s Day 2010. She adores it, and has it spread, carefully, on her bed. 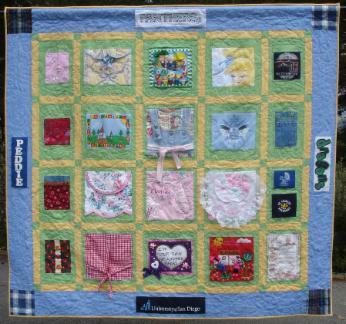 I would highly recommend Louise as your quilt maker if you are seriously considering having a memory quilt made." Fabrics: Two co-ordinating pink/blue and blue/purple fabrics combined with a pale yellow for the cornerstones. 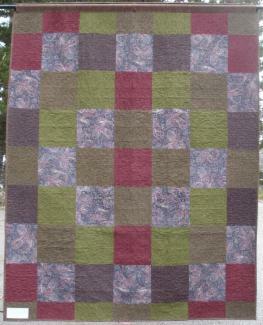 Quilting: Pantograph: "Curlz" in variegated thread of pale pinks and blues called Painted Desert by "Star". Here was an interesting commission. 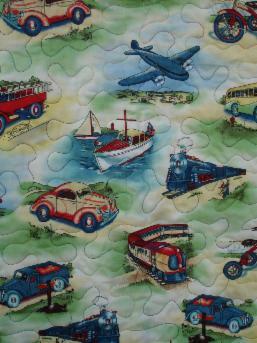 My client had already bought two bolts of fabric; one which had lovely whimsical images of planes, trains and automobiles, as well as boats, buses and bicycles in bright and cheerful colors intended for the front. 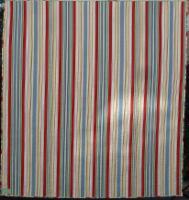 The other fabric matched in colors and was a delightfully soft flannel in a merry stripe for the back. The idea was to match the print on the transport fabric as near to the selvedges as possible, a bit like matching wallpaper, plus match the stripes on the flannel for the back of the quilt. I used a clever tchnique shown to me by a quilting buddy and the matching was near perfect! Friends that visited when I had it loaded on my frame struggled to see the join both on the front and back! I suggested that the flannel be used again for the binding (around the edge), plus making it a little wider than usual, and then my client suggested putting the stripe at an 45 degree angle (see below) which worked really well. Here are detailed shots of the binding on the bias and back flannel on the left. The picture on the right shows the detailed shot of the matched print which if you look really closely you might just see the seam down through the middle of the boat and to the left of the plane wingtip and the train. Fabrics: Primary colors in a transport print for the front and a striped flannel for the back. 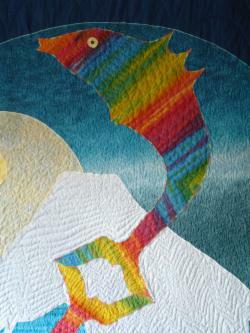 Quilting: Pantograph: "Crazy Puzzle" in primary colored variegated thread. This quilt was made for a young lady who has played soccer since the age of three and she is now in her early twenties and hoping to turn professional. 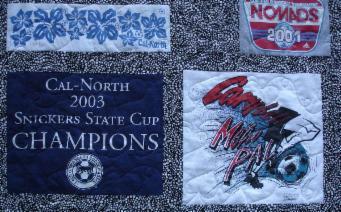 The quilt was made from the logos on T-Shirts worn and collected from all her soccer tournaments around the world. The orange and blue colors on the top and bottom square-in-square borders represent the two main teams that she played for; Presentation High School and Princeton University. Within each square-in-square were some of the smaller logos. 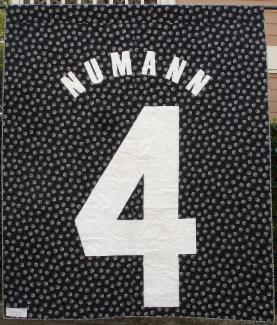 Her player number '4' is appliquéd and satin stitched onto the back and a sleeve added in matching fabric so that the quilt can be hung on the wall. The choice of black and white prints by my wonderful client was excellent in making the T-shirts the main focus and the fairly busy print on the front helped to disguise the piecing around each T-shirt section. In addition my suggestion of adding a 4" border around the outside made it appear as if the T-shirt logos were floating which was an interesting effect. 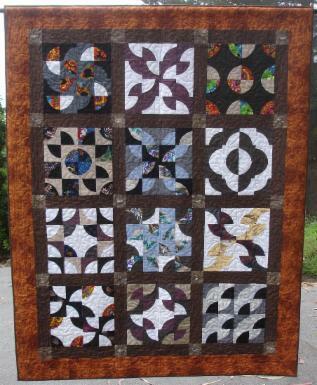 "We are so pleased with the outcome of this quilt. From beginning to end Louise has worked with us on every detail. As with any handmade item, there are unexpected changes & challenges but each one was handled and worked on professionally with love and care. Her ability to help focus the combination of ideas and suggestions was a true work of art keeping the end result in constant view. Our excitement to see her work completed is immeasurable. Louise is one of the nicest people you will ever have the pleasure to work with." Fabrics: Black & White prints on both the front and back as well as the orange and blue. 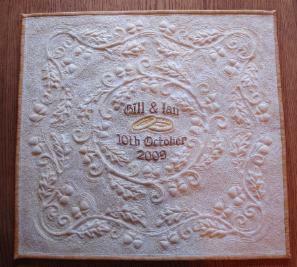 This pillow/cushion cover was commissioned by a friend of mine for friends of hers who were getting married. The main technique used on the front was Trapunto on a pale cream batik. 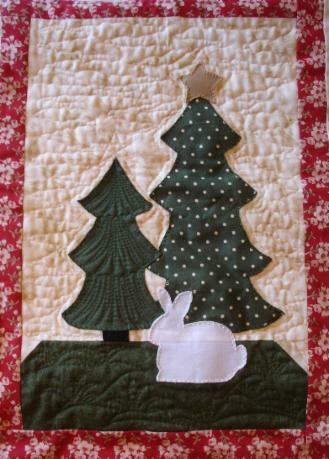 The oak leaves and acorns were echo quilted and then the gaps between were filled with a tiny random stitch. 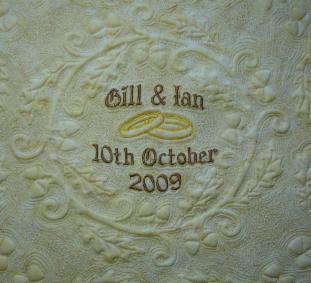 The names of the bride and groom, a pair of wedding rings and the wedding date was embroidered in the centre. 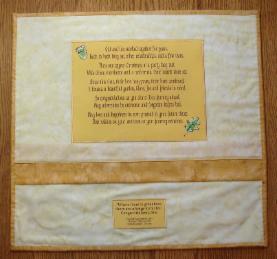 The back includes a poem that was written by my friend and added to the pillow cover using Printed Treasures fabric which was first fused and then the edges satin stitched. The darker fabric band is where the pillow filler can be inserted. 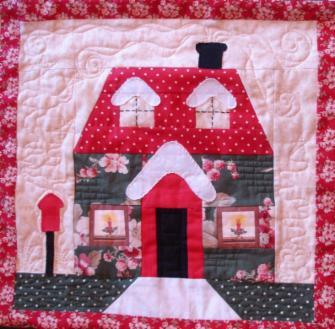 "Louise is a talented quilter, completing this pillow case for me as a wedding present. It was beautiful, individual and elegant as well as exquisite in detail. Louise understood what I wanted, gave me a choice of finishes and fabrics and kept me informed all the way through the process of its development. I would highly recommend her to family and friends and I am sure anyone would be very pleased with her work." Rock On! was commissioned by a lady for her husband whom she met at College some years previously. These are many of the T-Shirts that he would wear during that happy time and were all college music bands. Many of the T-Shirt motifs turned out to be of a similar size and therefore worked nicely together on the front. Careful placement ensured the best balance of color. The red and blue cornerstones are representative of the college colors. We managed to find great fabric for the back that had swirls of musical notes which was appropriate for the general theme of the quilt and worked well to hide the seam lines where the back was pieced to include the extra T-Shirt pieces in the centre. One of the T-shirt motifs was much longer than the others and two had short but wide motifs, so we decided to place these on the back, plus adding simple four patch blocks with the college colors brought that theme round to the back too. 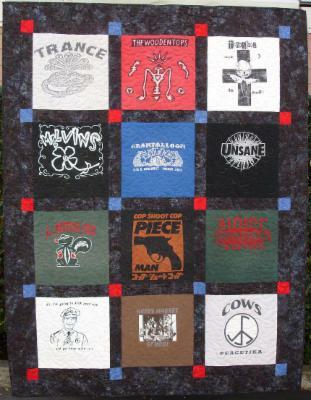 "It was a pleasure working with Louise on a "concert" T-shirt memory quilt for my husband. With my limited knowledge of the quilt creation process, Louise introduced wonderful design ideas and material choices - I knew I could trust her artistry and good sense. The end result was exactly what I had hoped for. I can't wait to give my husband his gift this Christmas! I know he will love it." I loved creating this quilt - what an interesting challenge! 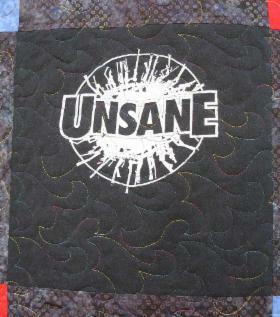 This design was shown to me, by my friends from Florida as a small image from the web (1.5" x 1") and from that small image I created this commissioned quilt measuring approximately 100" square. The centre circle on the finished quilt is 60" wide to give you a sense of scale. The templates for the fish and mountain pieces I drew by hand and the quilting stitches emphasised a different texture for each part; sky, mountain, moon etc. 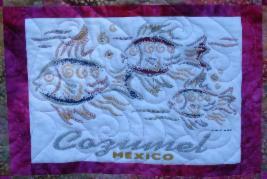 The fishes were quilted with scales and fins, and large scales were quilted into the blue background. The yellow and red motifs were satin stitched and appliquéd. "Louise, while your Mondrian impression for us was already stunning and impressive, you've now outdone yourself again! When we asked if you could capture the spirit and the memories of Japan in a quilt, we would have never thought the outcome could really be so authentic, so unique and so beautiful. You have truly captured the core essence of Zen-like serenity and balance with sheer perfection; we were amazed that the cost was so reasonable, as you have, once again, created yet another timeless and invaluable masterpiece for us. Thank you so much. We'll be forever grateful." This quilt was my first ever commission. It was based on the Dutch artist Mondrian's 'Composition A' to which friends from Florida introduced me. Initially, I thought "squares & rectangles; how hard can that be!" but then I found that there were very exact proportions to be taken into consideration, however, after a little math and scaling up, I had it all worked out! Initially I wasn't keen on this design - a bit too 'modern art' - but the more I worked on it the more I grew to appreciate it, especially after making and applying 888" of bias binding between all the colors! It was echo quilted very minimalistically which was in keeping with the theme, but even the positioning of the quilting had to be precisely calculated. 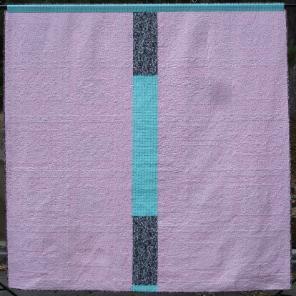 Quilting: Simple straight lines in ever decreasing squares in thread to match the color of each section. "Wow! This quilted rendition of our favorite Mondrian painting simply looks and feels phenomenal. Thank you so much Louise. We would have never expected it to come out so perfect. 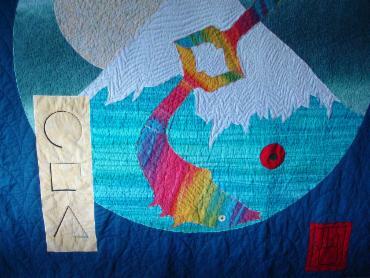 You're a true master of the art, and the attention to detail you put into making this quilt for us is just incredible. Since we can't have the original Mondrian painting, this quilt is definitely the second best option, and your price was really more than generous! It's certainly been the most admired talking piece among all our friends who came to visit ever since it arrived, and they all wanted to know where it came from and who made it. We hope you don't mind that we told them"